Sir Alfred Herbert acquired Town Thorns Manor at Easenhall in the late 1930s as place to which Coventry children could be evacuated in time of war, and gave it to Coventry City Council. After the war, it was turned into a school for children with learning difficulties. 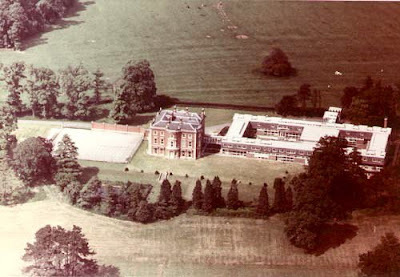 The Town Thorns Residential School for ESN Children was opened in January 1954, run by a Mr Brittan and his wife. "Many times since January 20th when we opened as a residential school for ESN children, the boys and girls have spoken about the "lovely house" and "when are Sir Alfred and Lady Herbert coming to visit us?" We are very grateful for this opportunity to work with these problem cases in such delightful surroundings, and both the children and staff would welcome the chance to thank you personally. Perhaps the best thanks you can receive is to know how great has been the change for good in these children - mentally, morally and physically." One of the children wrote to them on 1st November 1954, "I am writing to thank you for giving us the use of this school and its grounds. Perhaps you would like to visit us one day for lunch or tea. Please write to say when you can come. Our album will show you some of the things we are doing here. Yours faithfully, Pauline Plant". Later letters - written up until 1956 (Sir Alfred died in 1957) thank them for various gifts - a boat for use on the lake, 'waist slips' for the girls, fountains pens and propelling pencils and the like. Although after Sir Alfred died in 1957, Lady Herbert maintained her links with the school, but she suffered a stroke in 1963 and never recovered.